Additional information courtesy of Bob Frosaker -- Frosaker Motors was located on Broadway (2nd Street), south of Stearns Motors, about where the Wells Fargo Drive-up Bank is now. Frosaker Motors was a Chevrolet Dealer and the building 3 stories. The basement was used for auto parts storage and also a car wash. The main street level were offices, show room for 1-2 vehicles, and parts department. The 2nd floor was used for mechanics and new car get-ready. The 3rd floor was used as the paint and body shop. In the 50's a new one story service department was constructed on the west end of the building. The 2nd floor was then utilized for used cars. The used cars were brought to the upper floors by way of a large freight elevator… That elevator may have been the main access to upper floors. 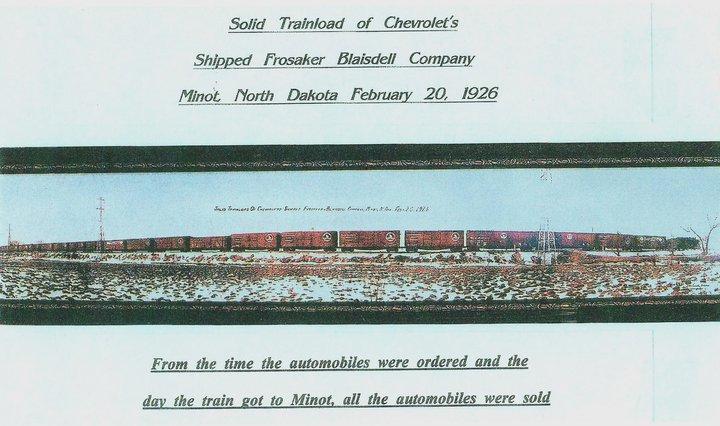 Th1s is a picture of a train load of Chevrolet automobiles. Chevrolet had asked Ole "How many new cars he wished to order?" 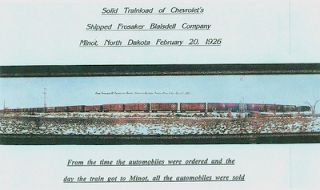 he said "Send me a trainload" The trainload was sold before it reached Minot. Frosaker Motors eventually became Ryan Chevrolet.